Sharon McElroy and Esperanza Perkins' mutual interest in community and familial connections and their love of textiles informs their collaboration, which represents a continuing and developing dialogue between their two practices. On The Edge Of My Seat was developed initially for Brighton Artists Open Houses 2018, and explores social and familial bonds and people’s relationships to their surroundings; re-contexualising familiar motifs and objects associated with the seaside environment; a combination of typography and printed, stitched ‘drawings’ highlight the contrast between people’s dreams and aspirations, and the realities, for many people, of a transient and marginal existence in a coastal town. Ties That Bind At The Water's Edge combines Esperanza’s crochet skills, passed down through her maternal grandmother with Sharon’s filmmaking and site and community responsive practice. 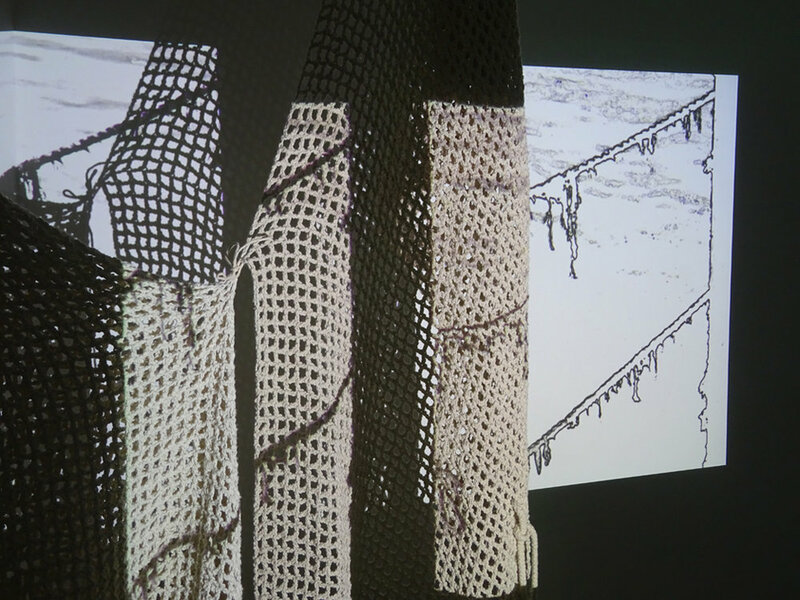 The piece explores common features that are found within domestic crochet and commercial fishing environments. 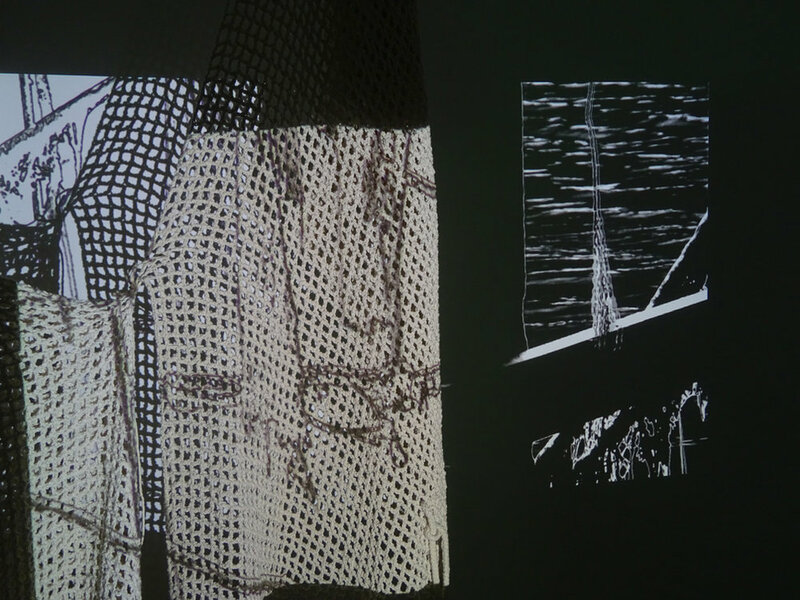 Pattern, repetition, line and form are expressed through the knotting, looping and stitching of yarns and threads and a series of digital ‘video drawings that reference the waterfront of a working harbour. Juxtaposing these structures and contexts, the artists highlight the notion of the decorative and the functional, and ‘feminine’ and ‘masculine’ traditions. Sharon McElroy and Esperanza Perkins have shown in London, Nottingham and Kent, and for 2018, are participating in Brighton Artist Open Houses and the Whitstable Biennale Satellite programme. 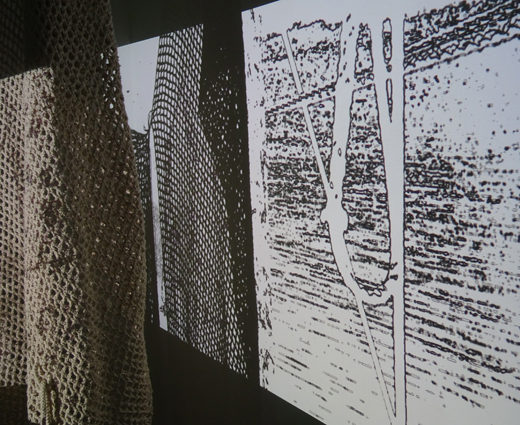 Sharon McElroy uses video, installation and costumed performance to investigate the heritage, context and formal qualities of a site and the ways that communities connect with their associated environments. She has a BA in Time based Media and an MA in Fine Art, both from Wimbledon College Of Arts. Sharon McElroy has exhibited widely in the UK.